Airblox are a set of large, life size geometrically shaped panels in mathematical proportion, each with an inflatable air filled rim. With special easy lock connectors �Clips,� AirBlox can be connected together to construct an unlimited number of structures such as houses, castles, tents, airplanes, huts, mazes, obstacle courses and much, much more. AirBlox can be used both indoors and outdoors. 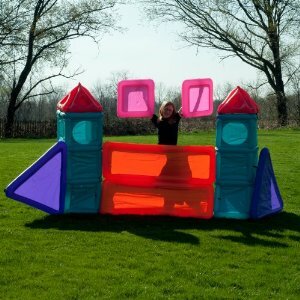 Airblox are ideal for children ages 2 and up, but even adults will enjoy building structures. In the case of very young children, parents (or teachers) can build structures and the children can play in them. Parents (and Teachers) can work together with slightly older children to build structures as a team. Other children can team up with friends and siblings or build structures on their own. Each Airblox is fitted with a micro valve for rapid deflation and inflation. This AirBlox set is made up of 10 individual geometric AirBlox shapes with special connectors called �Clips� to connect the AirBlox together.